Ya Baghat el'Id by Om-Kolthoum (also spelled many other ways: Om-Kalsoum, Oum Kuthum, Um Kaltsum, etc). 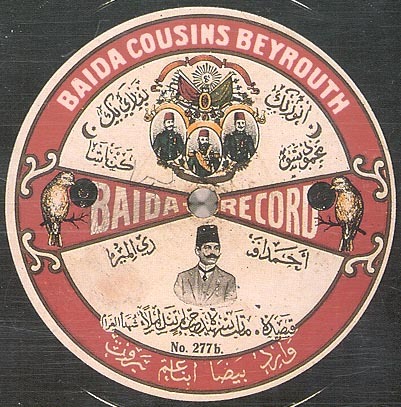 Recorded in Cairo in 1937. She was the greatest of all Egyptian singers, and one of the greatest singers in all the world. After she died in February, 1975, more people attended her funeral than attended the funeral of President Nasser. Om-Kolthoum was "The Star of the Orient!" Nahj Elborda by Om Kalsum 1950s? Qasida "Saluha Limadha" by Muhammad Al Ashiq from Syria. Gramophone GC5-12561. 1909. Nawbah Gharibat Al-Husayn - Fifth Mizan - Part 1 Andalusian Nawbah from Morocco. Orchestra Al-Brihi de Fes. Haj Abdelkrim al-Rais, director. Nawbah Gharibat Al-Husayn - Fifth Mizan - Part 2 Andalusian Nawbah from Morocco. Orchestra Al-Brihi de Fes. Haj Abdelkrim al-Rais, director. Zay El Hawa - Part 1 Abdel Halim Hafez. Soutelphon recording. 1960s. Zay El Hawa - Part 2 Abdel Halim Hafez. Soutelphon recording. 1960s. Evic Taqsim by Cemil Bey, kemence. About 1910. Taqsim Rasd by Muhyiddin Ba-Yun from Libia. Baidaphon B-082703. 1920.